Family traditions once revolved around visitation and remembrance at the gravesites of loved ones. That custom will be recreated as the Beecher Mausoleum Guardian Angel Association will host families of ancestors buried inside the Beecher Mausoleum. At the same time, the building, which is undergoing restoration, will be re-dedicated in this, its 101st anniversary. 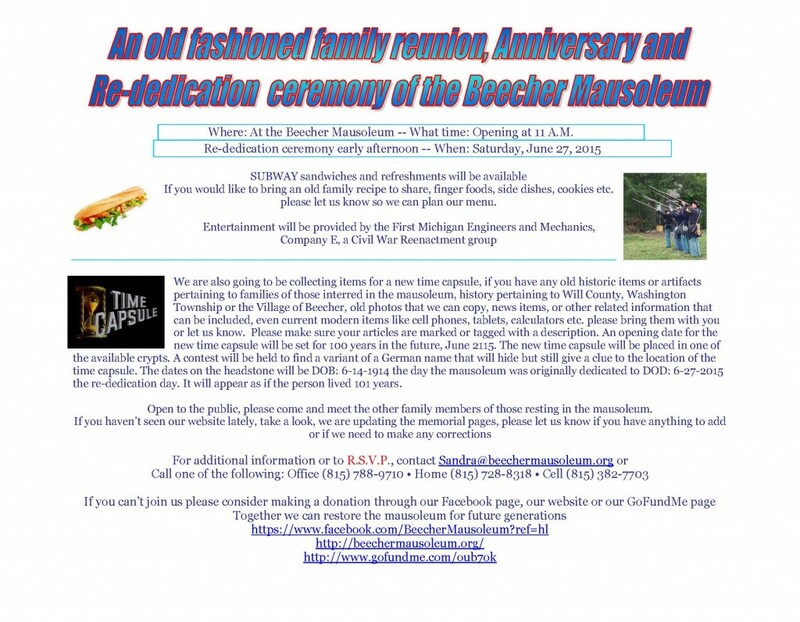 At noon Saturday, June 27, some families will travel to Beecher, some for the very first time, to enjoy a solemn moment with their loved ones as well as celebrate the mausoleum restoration. Representatives from the Bahlman family will be coming to the event from Virginia, Indiana and Florida. The Wehmhoefer/Hoffman family descendants from Missouri are planning to attend. Members of the Thielman / Bielfeldt / Kuhlman families are flying in from Georgia. Other family members from California and Idaho are also expected. Some of these family members will come to Beecher for the very first time, while others are returning after years of absence. All of the ancestors whose relatives are buried in the mausoleum have been invited. It is hoped that many local families will also attend the celebration. The day will also be a festive event to celebrate the ongoing restoration of a beautiful national landmark. Entertainment will be provided by Civil War re-enactors. Thielman adds that with the support of Landmarks Illinois, Berglund Construction and the trade unions we really do have something to celebrate. The major restoration needs to preserve the mausoleum are now complete. But despite all that has been done, there is still work to do. Restoration work is ongoing. Maintenance of the building and its grounds will continue in order to return the mausoleum to a functioning asset to the community it once served. The next phase of the work to be undertaken will include marble restoration, stained glass replication, and landscaping. The Bricklayers Union #21 that did work on the limestone have been in contact with suppliers and craftsmen who work with marble. The marble panels and head stones that were damaged by vandals in the past are slated for repair or replacement as funds become available. Stained glass windows will be replicated by Eric Suevel, Suevel Studios, Arlington Heights. 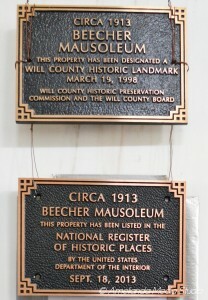 The Beecher Mausoleum Guardian Angels and the Thielman Family are sponsoring several windows. Other windows are available for sponsorship. A landscaping plan will be in part designed by Theresa of Harms Farm, McHenry. Along with donated landscaping material from local nurseries. Local community groups are encouraged to help in the planning, planting and maintenance of the landscaping. We hope to return the mausoleum grounds to a park like setting. Refreshments and entertainment will be provided.